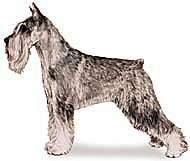 The Standard Schnauzer is a robust, heavy-set dog, sturdily built with good muscle and plenty of bone; square-built in proportion of body length to height. His rugged build and dense harsh coat are accentuated by the hallmark of the breed, the arched eyebrows and the bristly mustache and whiskers. 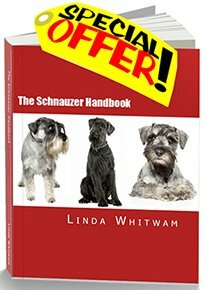 AKC Standard Schnauzer - Faults--Any deviation that detracts from the Standard Schnauzer's desired general appearance of a robust, active, square-built, wire-coated dog. Any deviation from the specifications in the Standard is to be considered a fault and should be penalized in proportion to the extent of the deviation. 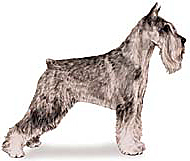 AKC Standard Schnauzer - Size, Proportion, Substance Ideal height at the highest point of the shoulder blades, 18½ to 19½ inches for males and 17½ inches to 18½ inches for females. Dogs measuring over or under these limits must be faulted in proportion to the extent of the deviation. Dogs measuring more than one half inch over or under these limits must be disqualified. The height at the highest point of the withers equals the length from breastbone to point of rump. Bite--A full complement of white teeth, with a strong, sound scissors bite. The canine teeth are strong and well developed with the upper incisors slightly overlapping and engaging the lower. The upper and lower jaws are powerful and neither overshot nor undershot. Faults--A level bite is considered undesirable but a lesser fault than an overshot or undershot mouth. Chest of medium width with well sprung ribs, and if it could be seen in cross section would be oval. The breastbone is plainly discernible. The brisket must descend at least to the elbows and ascend gradually to the rear with the belly moderately drawn up. Fault--Excessive tuck-up. Croup full and slightly rounded. Tail set moderately high and carried erect. It is docked to not less than one inch nor more than two inches. Fault--Squirrel tail. AKC Standard Schnauzer - Faults--In weighing the seriousness of a fault, greatest consideration should be given to deviation from the desired alert, highly intelligent, spirited, reliable character of the Standard Schnauzer. Dogs that are shy or appear to be highly nervous should be seriously faulted and dismissed from the ring. Vicious dogs shall be disqualified. Males under 18 inches or over 20 inches in height. Females under 17 inches or over 19 inches in height. Vicious dogs.